Mold serves a useful purpose outdoors by helping in the decomposition of dead trees, but inside a house, it can cause allergic reactions that range from sneezing or a rash to potentially life-threatening asthma attacks. 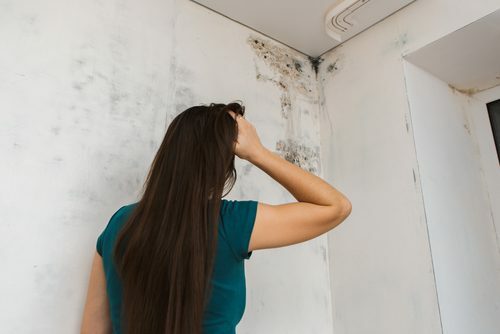 Because mold cannot grow without moisture, homebuyers should be concerned about identifying the source of the moisture and the cost to repair or eliminate it as much as they are about the mold itself. Most current laws that require sellers to disclose knowledge they might have of the existence of mold in a home do not require testing or remediation, so purchasing a home with mold is truly case of buyer beware. Mold spores are airborne particles that are invisible to the naked eye. People are exposed to them on a daily basis both indoors and outside without suffering from any adverse reactions. The trouble begins when the spores land on a damp surface inside a house and mold begins to grow. None of the different types of mold is capable of growing without moisture, so eliminating mold in a home involves more than just treating the mold. Permanent results require getting rid of the source of the moisture. A person’s sensitivity to mold will determine the potential health risks from exposure to it. Some people are more sensitive than to mold than are other people. Tests are available to identify the type of mold that is present, but testing can be expensive and a person who is sensitive to mold should avoid exposure to any mold found in the home regardless of the type. Reactions to exposure to mold can range from eye and skin irritation to life-threatening asthma attacks and lung infections in mold-sensitive individuals. A home inspection by a licensed Las Vegas Home Inspector and qualified home inspector should be the first step for a buyer who is interested in purchasing a home that might have mold growth. Sampling and testing to determine the type of mold that is growing is not as important to a buyer as identifying the source of the moisture that is causing the mold spores to grow. Knowing whether the moisture is coming from an easily repairable leaking pipe or from a more problematic and costly flooding condition will give the buyer an idea of the cost of remediation when it comes time to negotiate with a seller about repairs and remediation. California enacted the Toxic Mold Protection Act in 2001 to address concerns about mold in rental homes and homes offered for sale. Similar to mold disclosure laws in other states, the California law makes sellers disclose mold conditions to buyers. The law requires disclosure when sellers have actual knowledge or reasonable cause to believe mold exists in a home. For example, a seller who had mold removed from surfaces in a bathroom, but was told by the cleaning company that mold could exist behind the wall, would have reasonable cause to believe that mold could still exist. The California law does not require testing or remediation by a homeowner. Controlling mold growth requires a combination of cleaning the growing mold and eliminating the source of the moisture. Homeowners who are highly sensitive to mold might want to leave removal of mold growth to experts rather than risk exposure. A homeowner can clean mold from surfaces such as counter tops, walls, sinks and tubs, and shower stalls with water and detergent. It is a good idea to call in a company that specializes in mold remediation to handle mold behind walls or covering large areas. Elimination of the moisture source could involve repairing a water leak or stopping water seepage, using dehumidifiers or air conditioners to remove moisture in the air, or using a vapor barrier between a carpet and concrete floor to control moisture. Some insurance companies are refusing to renew or issue homeowner’s insurance policies on homes that have an active mold condition or where there is evidence of a prior mold problem. Buyers may also have difficulty obtaining a mortgage guaranteed by the FHA for a home that has mold. An FHA appraisal that is finds evidence of mold in a home will be contingent upon remediation of the mold and elimination of the moisture condition before the lender will allow the closing of title to take place. Unless the seller or the buyer takes care of it before closing, the buyer might be unable to close on the mortgage loan. A buyer who is made aware of a mold condition by a home inspection or seller disclosure should negotiate to have the seller clean the mold and eliminate the moisture condition prior to the transfer of title. If the seller will not undertake remediation, then a buyer should get estimates for the cost of doing the work and negotiate a reduction of the purchase price. At least with an estimate of the cost, a buyer can make an educated decision whether or not to purchase the home if the seller refuses to reduce the price. One thing a buyer should always have in mind when negotiating to purchase a home with a history of mold issues is resale value. Some buyers do not want to have anything to do with a home that has a history of mold growth. Buyers should give careful consideration to the negative effect mold could have on the future resale value of the home they are thinking of buying. Should you Buy a home with Mold Damage?